A Doraemon exhibit in Hong Kong in 2012. The latest Doraemon film is setting records in China. China-Japan tensions may still be high, thanks to unresolved wartime issues and a territorial dispute, but that didn’t stop Chinese fans from flocking to see the Japanese cartoon character Doraemon on the big screen this week. Stand By Me Doraemon, a 3-D animated film about the blue robotic cat, earned $33.47 million in its opening weekend and reached a four-day total of $38 million by Tuesday. The anime movie displaced the latest Avengers film to claim the top spot at the Chinese box office. That was enough to set a few records, according to pro.boxoffice.com. The film destroyed the record for a non-Hollywood imported film, topping Russia’s Stalingrad, which grossed $11.75 million. Plus, Stand By Me Doraemon can now claim the three highest-grossing single days of an animated film in China. Kung Fu Panda 2 still holds the record as the highest-grossing animated film in China overall, with $92.6 million, but that could change if the latest Doraemon movie holds strong. That success is all the more impressive considering the context. 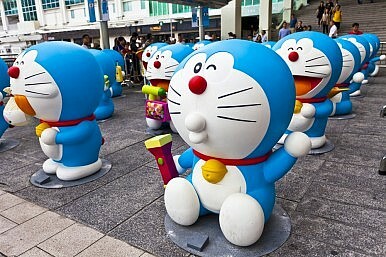 Stand By Me Doraemon was the first Japanese film to win a nationwide screening in China in three years. Japanese films fell victim to the political tensions between Beijing and Tokyo, largely thanks to the flare-up over the Senkaku/Diaoyu Islands after Japan moved to nationalize the disputed islands in 2012. China-Japan relations are strained at the grassroots level as well – a September 2014 survey by the Genron NPO and China Daily showed that 86 percent of Chinese have an “unfavorable” impression of Japan (and 93 percent of Japanese felt the same way about China). The political situation has improved somewhat since then, with a highly anticipated handshake between leaders Xi Jinping and Shinzo Abe in November 2014 paving the way for more high-level political contacts. That thaw is what made it possible for the Doraemon movie to overcome the moratorium on Japanese films in the first place. Still, as China focuses on the 70th anniversary of the end of World War II, criticisms of Japan and its attitude toward history are in the media almost every day. Such articles do have a point: Japan is well aware of the soft power potential of its animated creations. Doraemon was officially named Japan’s “anime ambassador” in 2008 by then-Foreign Minister Masahiko Komura. “Doraemon, I hope you will travel around the world as an anime ambassador to deepen people’s understanding of Japan so they will become friends with Japan,” Komura said at the ceremony. Still, Chinese internet users (especially younger people who grew up watching Doraemon cartoons) ridiculed the idea that the blue cat was somehow brainwashing China’s youth. China, meanwhile has a long way to go. “China’s indigenous cultural products are much less influential. Complaints have been filed against the shoddy scripts and poor animation skills,” Liu said. In the end, the success of Doraemon has nothing to do with geopolitics: “The market and audiences don’t lie, and they treat cultural products on an equal footing.” If China wants soft power, it has a lot of work to do.